The end of the school year is sneaking up on us once again. I am sure you know that this can be a stressful time of year for some of our students, as they realize that big changes are on the horizon. For our students who crave stability, they can feel anxious about the idea of going to a new teacher, learning a new routine, and making new friends. 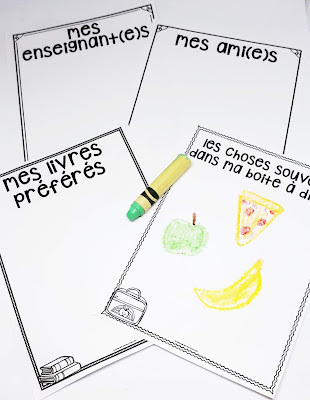 One thing that I love to do every year to help ease the transition of my students into grade one is create end of the year memory books together. Creating a memory book helps my students focus on the positives of the year we spent together, and feel relieved knowing that they can always look back and remember their year with me. And, it is fun for me to look back, reflect, and remember, too! 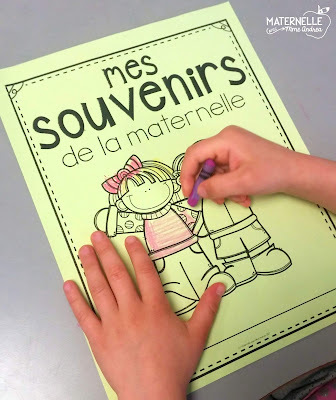 Sending home a memory book with your students can also help invite and encourage conversations at home about the highlights of your students' year, the things that they learned, and the special activities they did. Those parents who feel like getting their child to talk about their day is like pulling teeth will especially appreciate this activity! 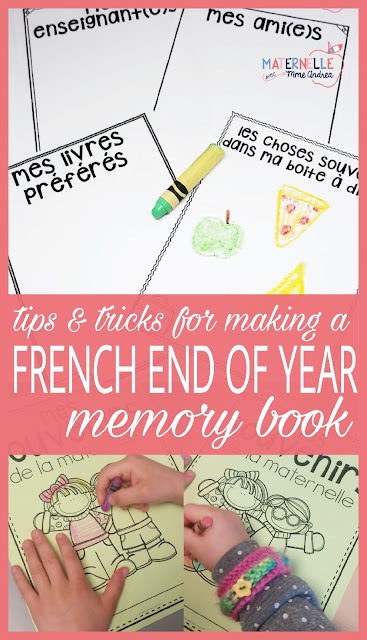 I have an end of the year memory book available in French in my TPT store. 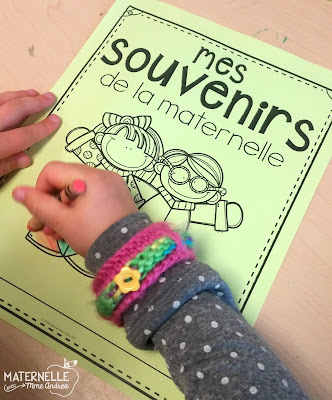 It is great for just about any elementary grade - it features five cover page options (Mes souvenirs de la pré-maternelle/maternelle/1e/2e année/l'école) and 22 different pages to complete for the inside. 18 of the 22 pages include both lined and unlined versions. Here are some suggestions for making your memory books - this is what I do! 1. Print the cover on coloured paper. It makes the book seem extra special! 2. Decide which pages you want to complete ahead of time, and how many days you want to work on the book. I like to do one page per day with my students, and we do 20 of the pages. That means that I need to plan ahead to start our book 20 days in advance! 3. Try doing one page a day. I find that this allows your students to produce higher quality work, because they don't work past their stamina and resort to rushing to get it done instead of doing their best work. Present the page, talk about it, brainstorm, model an example, and then let your students get to work. 4. Collect the pages each day as they are completed. Keep them together in a special folder until you are ready to put the books together. Put a page aside for students who are absent, too - when they have some free time another day, they can go back and complete the pages they missed. 5. Staple your students' books together and hand them back with their report cards on the last day. They will be so excited to see their beautiful work and to look back on their year! If you want an end of year memory book template all ready for you, be sure to check out the one in my TPT store. All you have to do is print and go - it couldn't be easier! Be sure to tag me on Instagram (@mme.andrea) if you take any pictures of your students' books!